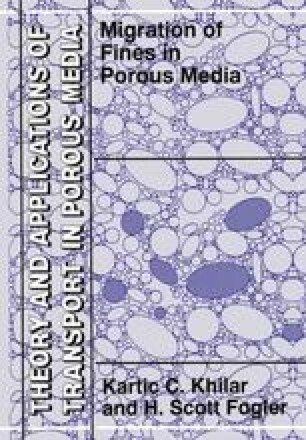 The fine particles adhering to the pore surfaces of the porous media of relatively higher porosity and permeability can be released or detached by the hydrodynamic forces. Hydrodynamically induced release of fines is found to be a more common occurrence in loose soil embankments and in packed beds than that in oil sandstone formations. There are two major reasons for this: (a) the flow velocity encountered is higher and (b) the fines are usually of large size and therefore experience a large drag force. We shall analyse these aspects later in this chapter.